Does your porch need a new look? What kind of a look would you like? A wood deck can be rustic. Want something classier? Why not spice it up with tile? Tile is virtually maintenance free. An added benefit is its cool feel in summertime. The purpose of this article is to explain installing ceramic tile on a porch. Most likely your porch is made of cement or its made of wood. Its not advisable to lay ceramic tile on directly on a wooden porch. Instead, screw cementfiber board to the wood surface. Apply fiberglass mesh drywall tape to the joints and skim them with thin set. Make certain that your wooden porchs surface and porch foundation is beefed up to carry the additional weight of cement board and tile so the tile wont crack. What tools and materials will you need for this tile project?. Here's your list. Get it together. Both porcelain and ceramic tile are good choices for your porch. Keep in mind that if you buy ceramic, it must be marked as frost proof or vitreous. This is especially essential if your weather will drop to the freezing point. And when you install the grout, mix in an acrylic grout additive. This will give it added flexibility. If youre laying tile on plywood, its imperative that the surface is sound. 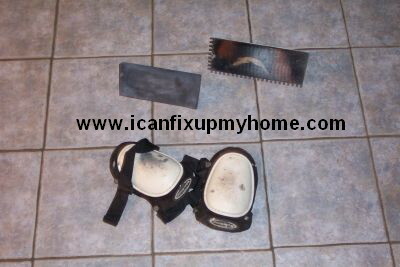 Give it a good inspection and repair the plywood subfloor if needed. If there are any high areas, eliminate them. Likewise if there are any low areas or cracks, fill them. The goal is to have a smooth and level surface. Your tiles size and their separation, or grout width, determines the layout and border size. As soon as you determine the layout, snap your two control lines using a chalk line. This marks the first full tiles starting from whichever corner you decide to work from. But, dont paint yourself into a corner, so to speak. Make sure that the chalk lines are square. Use the 3-4-5 method by measuring 3 feet on the first line starting from the intersection of the two lines. Mark the spot. Do the same thing with the second line measuring 4 feet instead. Your lines are square when the distance between the marks is 5 feet. Begin with several border and field tiles. Work out from the corner where your control lines intersect. Trowel out just enough mortar as far as you can reach. Use the wet saw to cut your border tile. A score and snap tool will only lead to frustration. After you lay several tiles, set them with light taps with your rubber mallet along with a beating block. Use the tile spacers between the tiles as you go. Let the mortar set for 24 hours. Time to Grout your Tile! The instructions for mixing the powder grout are on the packaging. It should be the texture of a milkshake. Begin by applying some grout at the corner of your porch and work outwards using a grout float. Work it in at a 45 degree angle with a sweeping motion. Use clean water to sponge the grout off the tile surface as you go. Shape a slight indentation in your joints. This should be done before the grout sets up so youll be grouting in sections. Once the grout is completely dried, use the grout sealer. Now, set out the patio furniture and enjoy!